As 2017 winds down for Travursity Travel Showcase and preparations begin for 2018; we are excited that our year will end with some exciting events. We will conclude with a pair of Travursity Agent Experience™ events that surely should not be missed! On October 25, 2017 we bring our event onboard the Gateway Clipper Queen River Paddle boat where our showcase and presentations will take place while we sail the Pittsburgh skyline. That’s right; our entire event will be on the water for a special evening of fun and education. Join us as we welcome suppliers such as Celtic Tours, Club Med, Sandals, Carnival, Katarina Line and Isram Israel. We still have room for a few more travel agents and registration is only a click away at http://travursity.com/events/event/pittsburgh-pa/. Although not an official Travursity Agent Experience™, on October 26, 2017, we are in Raleigh, NC for an educational evening including TravelSafe, Israel Ministry of Tourism, Sandals. Scenic Luxury Tours & Cruises, Emerald Waterways and Isram Israel. Registration is still open at http://travursity.com/events/event/raleigh-nc/. 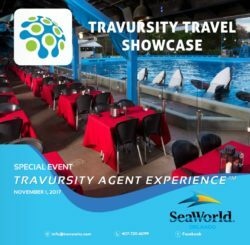 Finally on November 1st is our Signature Showcase and the biggest Travursity Agent Experience™ we have produced so far. Our event at SeaWorld Orland will include tours of Discovery Cove and SeaWorld, Supplier networking and presentations by TravelSafe, Israel Ministry of Tourism, Sandals, Carnival, Crystal Cruises, Isram Israel, Trafalgar and MSC cruises. This event includes lunch and a special dinner and show with SeaWorld’s Dine with Shamu experience. Registration is extremely limited and your space can be secured by registering at http://travursity.com/events/event/orlando-fl-3/. What a way to end 2017 and if this is any indication what 2018 might bring then we are in for a great time next year as we bring Travursity Travel Showcase to new regions and venues as well as some old familiar locations. We look forward to seeing you soon!